The main ingredient in many Sephardi Rosh Hashanah recipes is pumpkin. 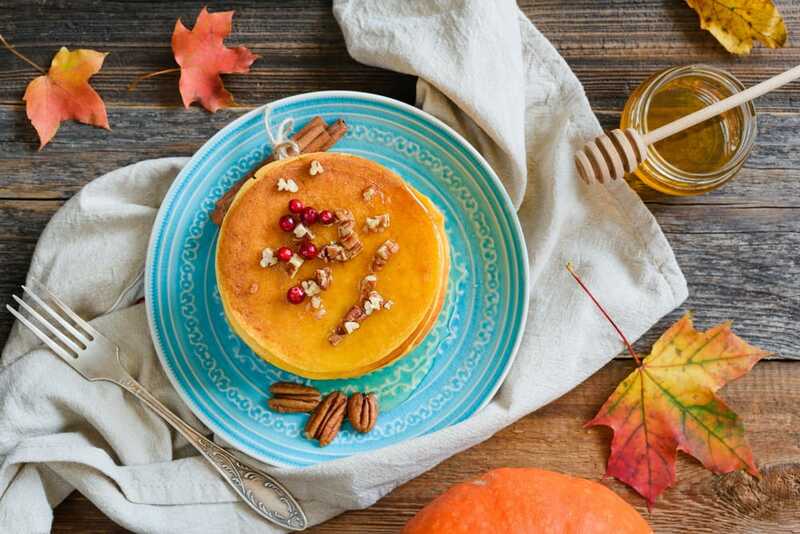 When you eat pumpkin, it’s expressing the hope that, much like the pumpkin’s thick outer flesh covers and protects the gourd, that man too, will be completely protected in the new year. A Rosh Hashanah specialty in many families is Kosher spiced pumpkin pancakes. This recipe is so good, that they can be enjoyed year round, too! 1. Preheat your oven to 250 degrees. Line a tray with paper towels to absorb any oil from the pancakes and have a baking sheet ready to keep the pancakes warm. 2. Put the pumpkin or butternut squash with the cut side down in a baking dish, then add about ¼ inch water. Cover the dish and microwave on high power for 8-10 minutes or until tender when pierced with a fork. 3. You can also cut the pumpkin into 6 or 8 pieces to poach it faster. To do this, add the pumpkin to a large saucepan with enough salted water to cover it halfway and bring to a boil. 4. Cover and simmer over medium-low heat for 15-20 minutes or until tender, turning once or twice. 5. In either case, remove the cooked pumpkin to a plate and let slightly cool. Scoop out pulp leaving the peel. Cut pulp into pieces if necessary and mash it with a fork. Press the pulp mixture gently in a strainer to expel any excess liquid. Transfer to a bowl. 6. In a medium bowl, combine flour, eggs, cinnamon, ginger, allspice, sugar, salt, and white pepper and mix: it will be a very thick batter. Add the mashed pumpkin and mix thoroughly. 7. Heat the frying oil in a deep skillet over medium heat. Scoop the pumpkin mixture by tablespoonfuls into the oil, flattening each after adding, and fry for about 2 minutes, or until it becomes golden brown on each side. Turn carefully, and be careful so the oil doesn’t splatter. 8. Once ready, transfer the pancakes to the pre-lined sheet. Make sure to stir the batter before frying each new batch to ensure an even mix. You can add additional oil to the pan as needed, and bring it up to heat before adding more pancake batter. 9. Once the pancakes have sat for a few minutes, letting the paper towel to absorb any excess oil, transfer them onto a baking sheet to keep warm in the oven. 10. When ready, gently pat the tops of the Kosher spiced pumpkin pancakes with paper towels before serving and top with yogurt or sprinkle with brown sugar.